The Cattle Raisers Museum is located on the 2nd floor of the Fort Worth Museum of Science and History at 1600 Gendy Street, Fort Worth, Texas. See map and parking information. Tuesday – Saturday:	10 a.m. to 5 p.m.
Sunday:	Noon to 5 p.m. There is a fee for parking in the Cultural District. 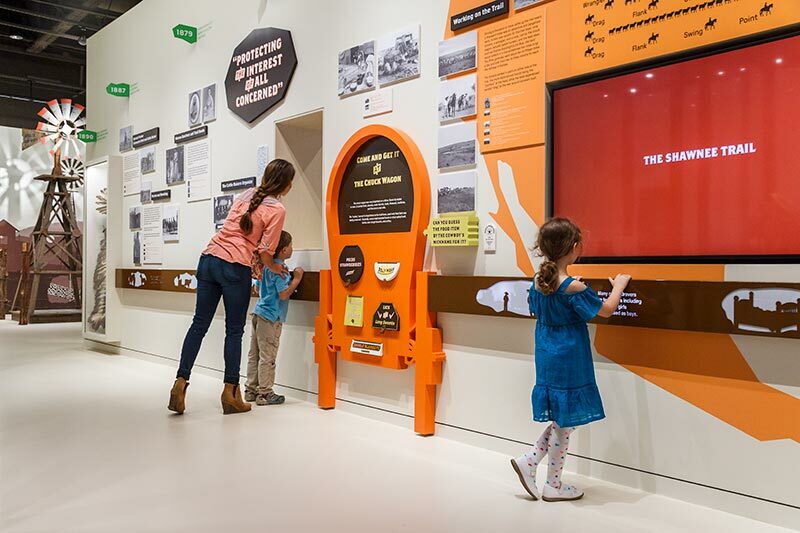 Paid exhibit admission includes admission to exhibits within the Cattle Raisers Museum and the Fort Worth Museum of Science and History, plus half-off admission to the National Cowgirl Museum and Hall of Fame located next door. Please note there is an additional fee to visit the Fort Worth Museum of Science and History’s Omni Theater IMAX Dome and fees for special exhibits may vary. The Museum welcomes groups from schools, businesses, churches, youth organizations and more. Group rates are available for 15 or more guests. To receive the group rate, you must book two weeks in advance. Please call the Fort Worth Museum of Science and History’s Group Services department between 8:30 a.m. and 4:30 p.m. Monday through Friday at 817-255-9440 or by emailing fieldtrips@fwmsh.org. Visa, MasterCard, American Express, Discover, cash, and personal or corporate checks are accepted. Please note: Students must be accompanied by chaperones at all times. Members receive FREE parking in the Museum lot which is located at the northeast corner of Montgomery Street and Harley Avenue, on a space available basis (except during the Fort Worth Stock Show & Rodeo). Membership cards are required to receive free parking. Please note that the free parking is on a first-come, first-served basis and does not apply to other lots in the Will Rogers/Cultural District. Membership does not guarantee an available, free parking space. Parking is limited. Non-members can park in the Museum Lot for a fee and should buy parking passes at the box office. The parking vouchers and passes are presented upon exiting the Museum Lot. All other parking lots surrounding the Museum are paid lots managed by the City of Fort Worth. The Museum cannot validate or provide parking passes/vouchers for these lots including the Western Heritage Garage north of the Museum or the Will Rogers West Lot east of the Museum. The Cattle Raisers Museum welcomes all guests and is wheelchair and handicapped accessible. For convenience, a limited number of wheelchairs are available on a first come, first served basis.